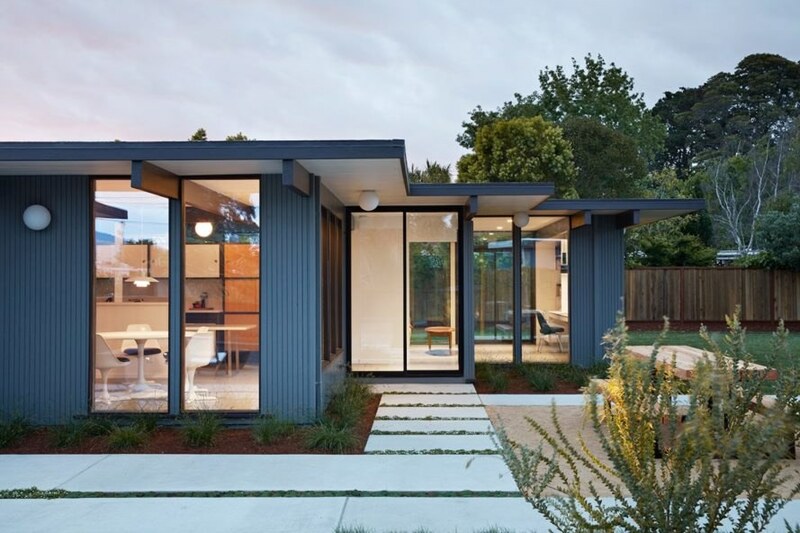 Klopf Architecture has refurbished and expanded a classic Eichler home in the San Mateo highlands while keeping its mid-century modern charms intact. Working in collaboration with Outer Space Landscape Architects and Coast to Coast Construction, the architects enlarged the single-family home into a 2,285-square-foot dwelling with four bedrooms and two baths. 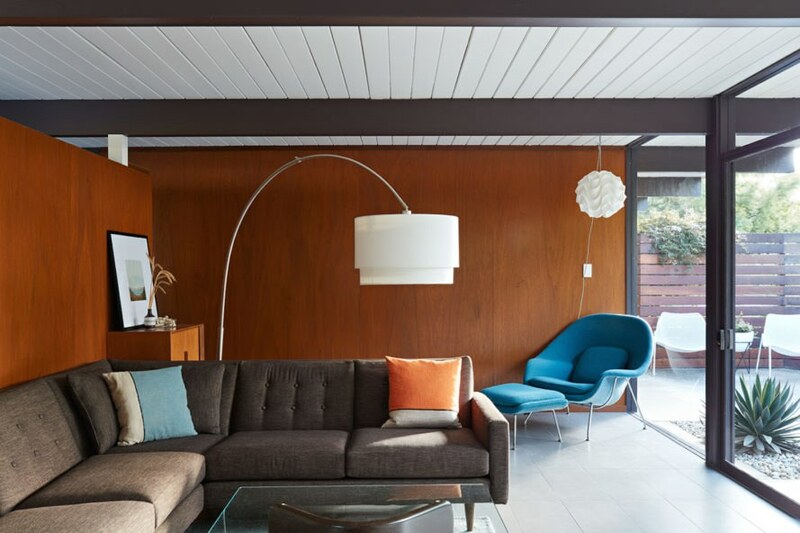 Set in the heart of Silicon Valley, the Eichler renovation was commissioned by a young couple with two small children, who, as evidenced by their choice in furnishings, sought to maintain the modernist and minimalist look of their home in the upgrade. 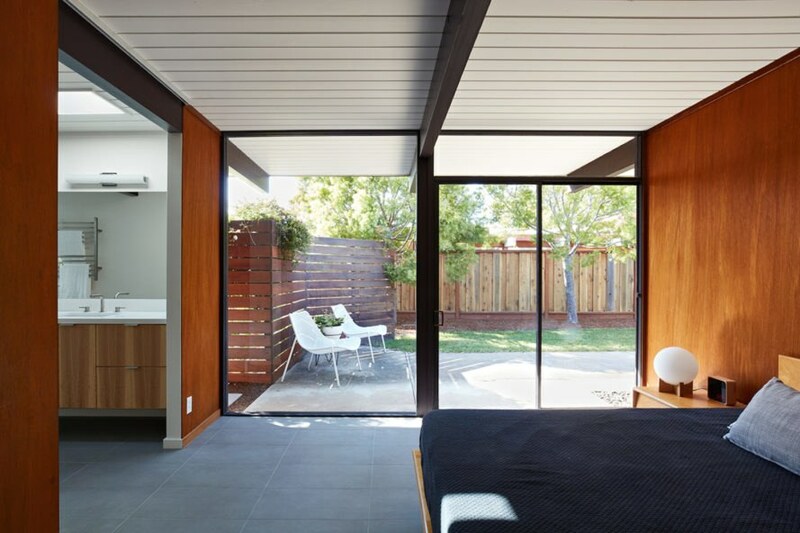 “The goals were to maintain the Eichler style while bringing in high quality, more current materials and updating what was already there,” wrote the architects. The clients also desired a new addition that would be used as an office and guest room. Using 3D modeling, the architects determined that the most suitable location for the addition would be in the side yard, rather in the rear due to set back limitations. “The addition needed to be transparent so it would not appear massive and take up the side yard,” added Klopf Architecture. Like the rest of the existing home, the addition features post-and-beam construction, Eichler profile siding, and dark bronze door frames. The bathrooms, entry, and storage were also enlarged. The interior is lined in timber paneling—some of which new to replace damaged paneling—all of which was re-stained to bring out the wood’s rich colors. The leaky steel radiant heating tubes were replaced with a new radiant floor heating system beneath concrete slabs and new flooring installed throughout the home. 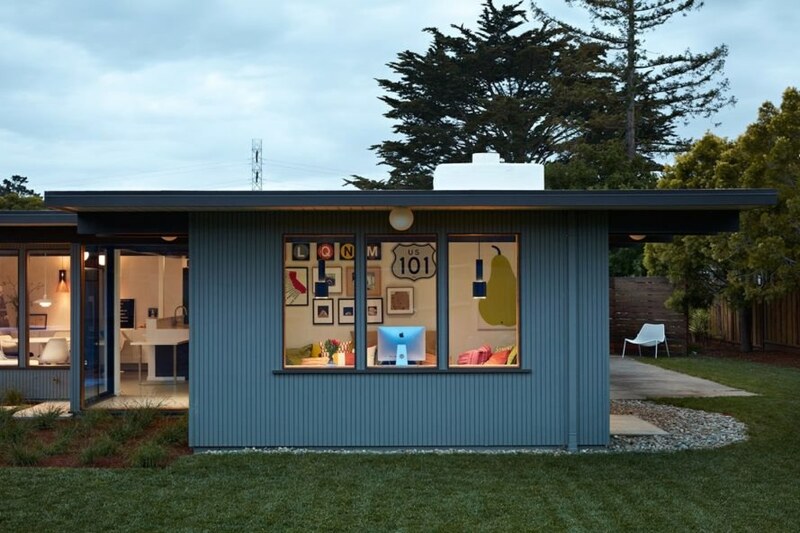 Klopf Architecture has refurbished and expanded a classic Eichler home in the San Mateo highlands while keeping its mid-century modern charms intact. 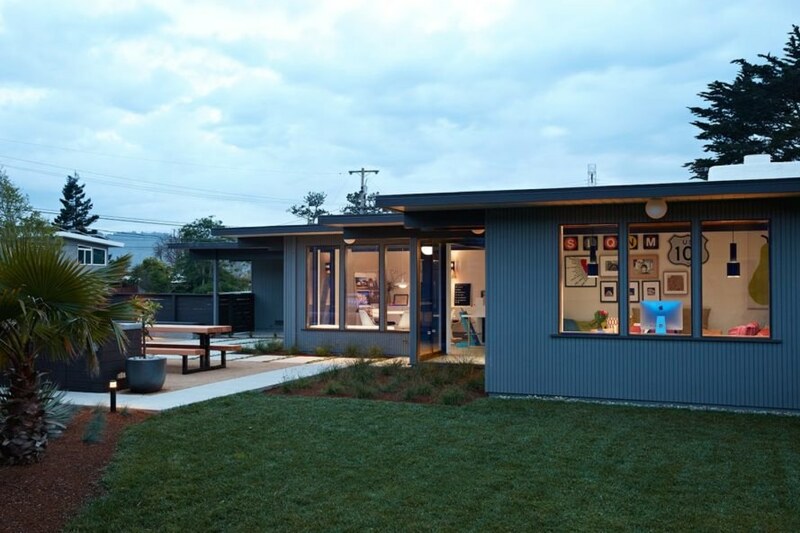 Working in collaboration with Outer Space Landscape Architects and Coast to Coast Construction, the updated single-family home was enlarged into a 2,285-square-foot dwelling with four bedrooms and two baths with the help of 3D modeling. 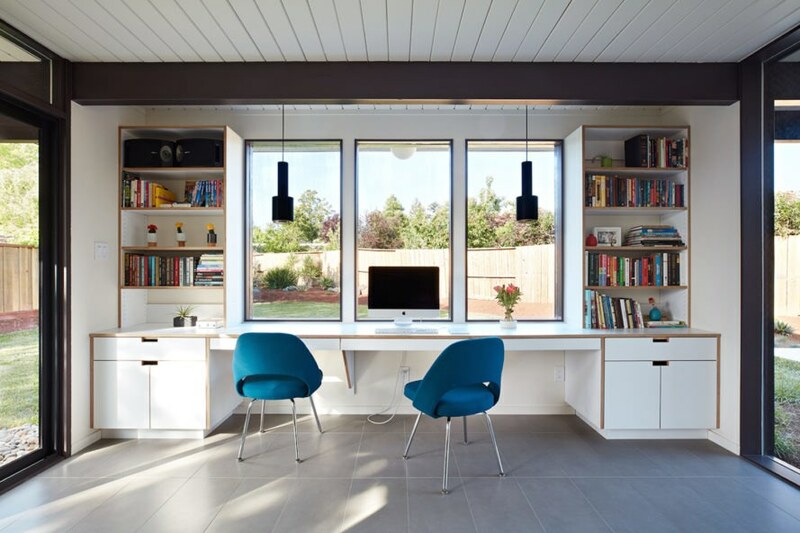 Set in the heart of Silicon Valley, the Eichler renovation was commissioned by a young couple with two small children, who, as evidenced by their choice in furnishings, sought to maintain the modernist and minimalist look of their home in the upgrade. 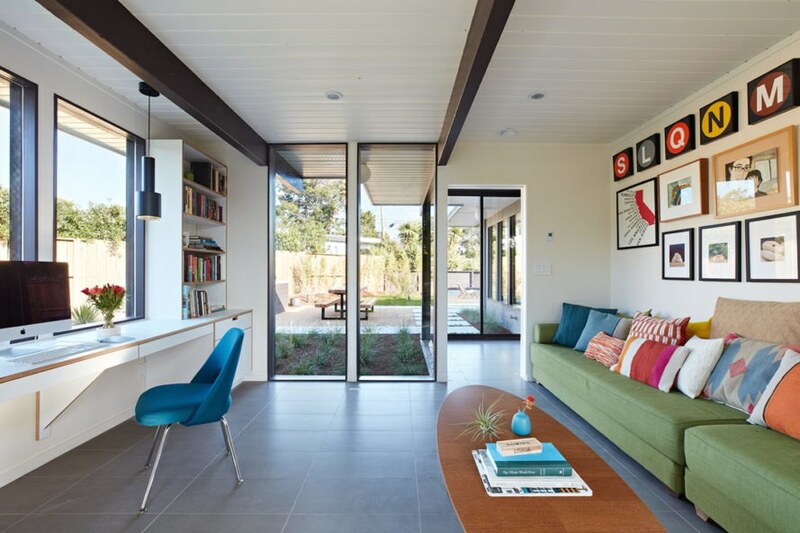 “The goals were to maintain the Eichler style while bringing in high quality, more current materials and updating what was already there,” wrote the architects. The clients also desired a new addition that would be used as an office and guest room. Using 3D modeling, the architects determined that the most suitable location for the addition would be in the side yard, rather in the rear due to set back limitations. Like the rest of the existing home, the addition features post-and-beam construction, Eichler profile siding, and dark bronze door frames. The bathrooms, entry, and storage were also enlarged. 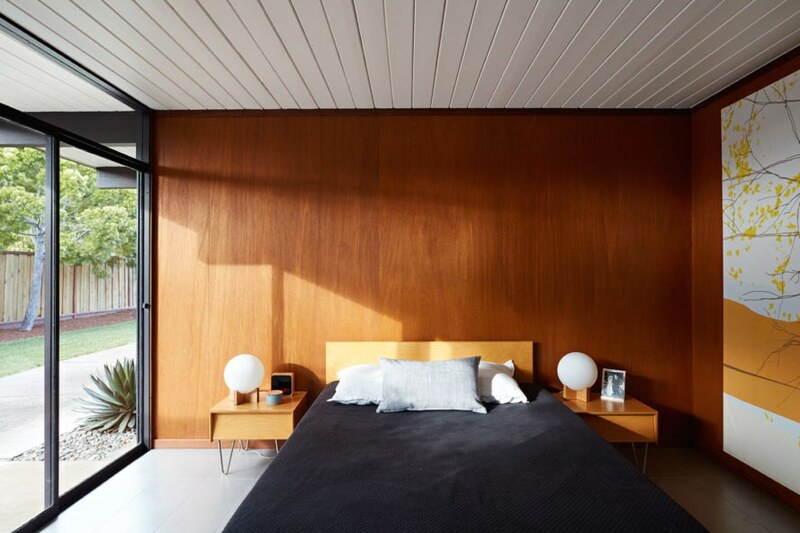 The interior is lined in timber paneling—some of which new to replace damaged paneling—all of which was re-stained to bring out the wood’s rich colors. The leaky steel radiant heating tubes were replaced with a new radiant floor heating system beneath concrete slabs and new flooring installed throughout the home.